Return to the wizarding world and discover how director David Yates and producer David Heyman brought J.K. Rowlingâs all new adventure, Fantastic Beasts and Where to Find Them to the big screen. Inside the Magic: The Making of Fantastic Beasts and Where to Find Them introduces filmmaking fans to Newt Scamander, Magizoologist, and the principal characters, locations, artifacts and beasts that he encounters in 1920s New York. Explore the filmmaking magic behind MACUSA, the secretive American counterpart of the Ministry of Magic; and the magical secrets of Newtâs case. Each section contains profiles of the key characters, with revealing insights from Eddie Redmayne, Katherine Waterston, Alison Sudol, Dan Fogler, Colin Farrell, and many others, together with sections on set design, costumes, make-up, special effects, art department & props (especially wands! ), which are illuminated by interviews with David Heyman, David Yates, Stuart Craig, Colleen Atwood and a magical army of other crew. 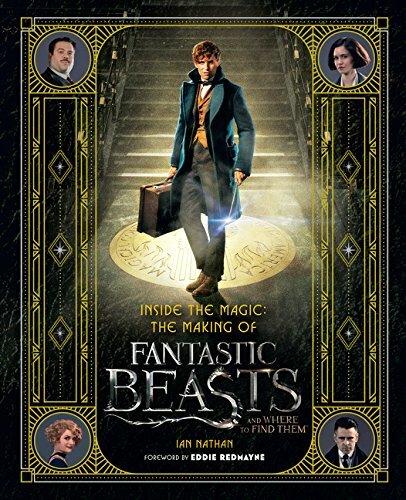 Packed with exciting photos that reveal the filmmaking process in discerning detail, and officially licensed by Warner Bros. Consumer Products, this is the definitive adult companion book to the film, and perfect introduction to Fantastic Beasts and Where to Find Them.